Spring break is all about having fun and staying safe. And so, in an effort to promote safe and responsible partying, Collegiate Marketing Group has partnered with both Coors Light and Miller Lite to provide free shuttle service during spring break in Panama City Beach, Florida. Using the slogan “The Original Way To Get Home Safe”, shuttles will be available from March 7th through 28th and will be at the ready between 7pm and 2am. 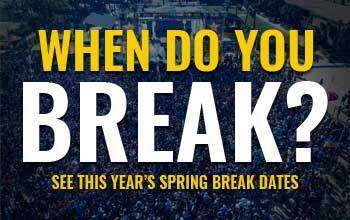 A full schedule of all the pick-up locations and stops are listed on a soon-to-be-updated website and spring breakers will also have access to a toll free phone number (1-800-FREE RIDES) which they can dial if there is a need for a pick-up. Most shuttles will be arriving at the busiest locations frequently, especially from the hours of 12am to 2am (arguably the busiest hours for students wanting to get back to their hotel). Panama City Beach, Florida is expected to host more than half a million students in the month of March, and continuous efforts are being coordinated in order to ensure proper safety for all spring break attendees. Both Coors Light and Miller Lite have taken a big step in wanting to help and ask that spring breakers be patient, wait for the shuttle, and make sure that you don’t drink and drive.